She has graduated from Istanbul University, Istanbul Faculty of Medicine, Florence Nightingale School of Nursing in the year 1982. In 1985, she has started working in Istanbul University, Istanbul Faculty of Medicine, Psychiatry Department, psychoneurosis service. In the year 1988, she has completed her graduate master’s degree in Istanbul University Institute of Health Sciences with the thesis entitled “The Effects of Application of Nursing Process on Recovery and Social Adaptation of Patients with Schizophrenia”, and received her doctorate degree in 1998 with the thesis “Investigation of Psychotherapy with Art in Psychotic and Borderline Patient Groups”. This doctorate thesis has won the Prof. Dr. Perihan Velioğlu Nursing Fund Prize of Science in 2001. In terms of psychotherapy education; between the years 1989 and 1994 she has attended the psychodrama education carried out by Moreno Institute and “Association of Group Psychoterapies and Psychodrama”. From 1992 till 1998 she has received individual psychodynamic psychotherapy and for 3 years she has attended the educational psychoanalytical psychotherapy meetings held in IMAGO psychotherapy center. She has received supervision from various psychotherapists in the field of psychodynamic psychotherapy. 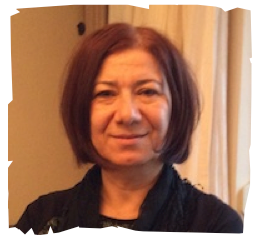 Since the year 1987, she has been working in Istanbul University, Istanbul Faculty of Medicine, Psychiatry Department as the Assistant Chief Nurse and the Responsible Head of Education. At the same time, she has been involved with the Social Psychiatry Service since 1990 and carried out psychosocial therapies with the psychotic patients in the day hospital format. Since 1994, she has been performing psychodynamic individual/group psychotherapies and psychodynamic art psychotherapies with patients with personality disorders at the same service. She is also providing supervision regarding personality disorders and group psychotherapies. Starting from the year 2004, she has been carrying out “Seminars in Art Psychotherapies, Experiential Group/Workshops” with mental health experts and artists in Istanbul University, Istanbul Faculty of Medicine, Psychiatry Department. In the year 2011, she has developed a project of “Art Psychotherapy and Rehabilitation Program” (SPR) for psychiatric outpatients and inpatients at the same clinic. In April, 2011 she has started working on this project by forming a group, executing training and supervision groups, selection of patients and forming of groups, and investigation of effectiveness of psychotherapy and rehabilitation activities in the project. Currently, she is still the director of the program.